The west boat ramp by the bridge on Woahink Lake is a dive that just about every one of our SCUBA friends in Oregon has done at least once. It is a popular place for training dives and a fun place to rinse gear in fresh water after diving at the SCUBA park on the Florence jetty. While the site is relatively small and visibility can be poor, people keep coming back here because of the quirky things left underwater by other divers. Everyone always seems to mention the KISS concert whenever they talk about this site. The reason that we come to this site is to see what new things have been added to the treasure trove of random stuff that divers have left underwater. Someone posed figurines of the band KISS into a mini concert on the north side of the dive site. There’s a toilet or two with funny things in the bowls. On the south end, we heard there might be a sunken model submarine. Florence, Oregon is just up the road from the dive site. Look for the signs for Jessie M. Honeyman State Park. Turn east onto Canary Road. Immediately after the first small bridge, park on the right. There is minimal parking at this site. One big dive group will take up all the space. 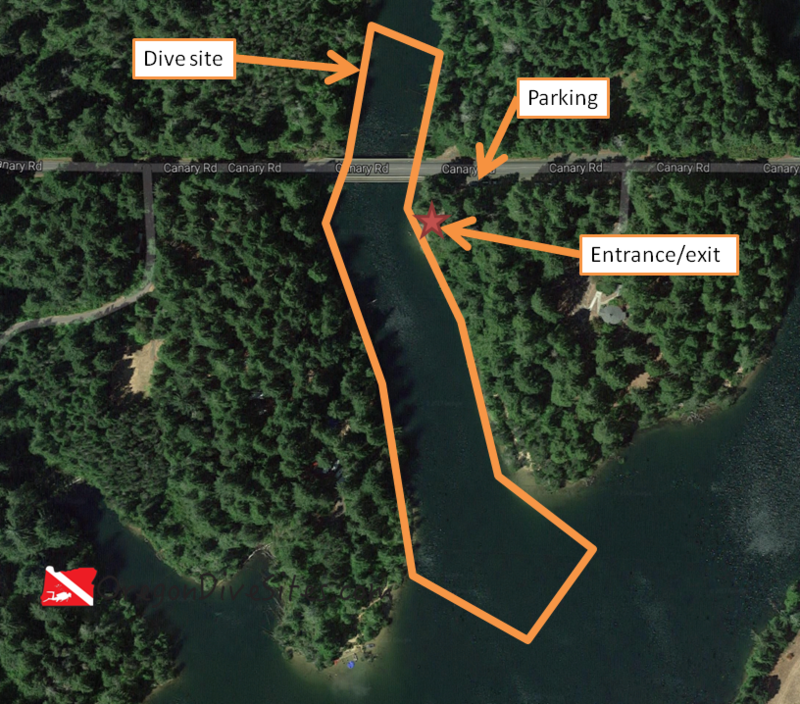 The site is often popular with SCUBA classes for Open Water courses so it’s a good idea to have some backup sites in mind like the East Boat Ramp at Woahink or the SCUBA Park on the North Jetty. The little SCUBA park that has been made at the old west boat ramp at Woahink Lake is a fun spot to spend a dive or two looking at all of the odd things people have left underwater. The site runs more or less north-south. There are a few things just north of the bridge but heading further up this finger of Woahink Lake won’t lead to anything interesting other than a few fallen trees. To the south past the submarine, you will find deeper water but not much else. The old boat ramp at the southeast corner of the bridge is an easy entrance. The last time we were here, there was a bit of a step down from the asphalt to the water but it wasn’t too bad. This is a fresh water dive. Conditions here are usually very benign. If an open water SCUBA class just got out of the water, visibility will be lousy though. If no one has gone diving at the site in the last day, we usually get 10-15 feet of viz at the west boat ramp in Woahink Lake. However, the bottom stirs up very easily and can reduce visibility to less than 5 feet. This is a good place to practice neutral buoyancy. Usually it’s between 48 and 56F here although we have seen it a little colder and a little warmer depending on the time of year. Any time of the year is a good time to go diving at Woahink Lake. We’ve hit 30 feet on the south side of this dive site but most of the site is a bit shallower. You can dive this site as soon as you have your open water diving certification. This is a pretty easy dive. There are a few submerged trees that you could get tangled in at the edges of the dive site but otherwise there aren’t any significant hazards that we’re aware of. If you have to park at the farthest parking spot, you might have to walk 200 feet. At the closest spot, you’ll need to walk about 50 feet. No surface swim is needed at this Woahink Lake dive site. This site gets a LOT of use from regional SCUBA shops. If a class is using the west boat ramp on Woahink Lake, go try the east boat ramp or the SCUBA park on the north jetty. There used to be a fill station in Florence but we recently heard (February 2017) that it is no longer operating. The closest place to get an air fill or gear service is in Eugene. Port Orford to the south or Depoe Bay to the north also may still have air fill stations. There are a lot of good places to eat along the old waterfront in Florence. We usually see river otters playing on the riverbank there, too! There are several state campgrounds in the area that are a good place to base yourself for a few days of diving in Florence. We haven’t tried any of the hotels so please let us know if you have a favorite that is good for divers.